This is my second time meeting a Presidentiable for 2010. Mar Roxas was first that happens last June 11 of this year. MMDA Chairman Bayani Fernando talks to us Bloggers, Writers and Student Leaders of Cebu for his will to serve the country by 2010. Verified from him that he will be running for President for May 2010 election. Bayani Fernando is succesful in his implementations of the ordinances that regulates Traffic and the like, Waste Management and Environmental Concerns, Common good for every citizen in the community by providing basic services and infrastructures within Metro Manila. His supporters stretches the idea that Bayani could also do it to the country what he started in the Metro of 11Million population. Bayani also talks of education where he inculcates that every textbooks in every year levels should be accomplished within the schoolyear and if not, we need to extend for months just to finished it. He emphasized this point because he sees that this is the main reason why we're behind by other nations in terms of learning. 'I need also to fullfil the benefits that a teacher must have' he adds, this might be the reason why textbooks are not completed as school year ends. I can say that Bayani is a straight-forward type of person with the way he answers our questions. He never hesitate to give counter plans in every problem we presented, and I can say that he is logical type of guy that knows how to solve all things up. He is more on "wisdom before folly" and "Technology against Ignorance". These are his answers with our query regarding our performances in global competition of skills and competencies. Personally, what I like with Bayani Fernando's profile is his 40 years composition of being an Executive Officer in a private company which means he really has the potential to governed laws and pursue developments and general welfare as experienced in work. I believe that the implementation within private firms is strict and very effective. He can use this asset and it can be his edge from his co-presedentiables. Im still crossing my fingers with these, Politics are politics. 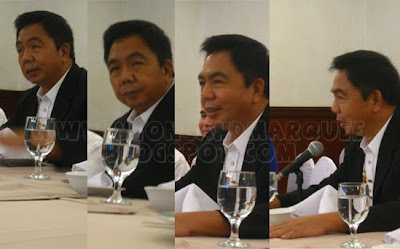 11 comments: on "Cebu Bloggers luncheon with Chairman Bayani Fernando"
Hi Rio, no one has raised a question regarding Charter Change, as well as any other type of govt. But, I will raised your concern to the online BF team, I will see if I can get some inputs from them. Thanks for the query! Cebu Ceboom! Naglibog ko. Daghan man dili ganahan niya. btaw bry, dili pod ko katubag sa imong mga pangutana kai dili gyud ta katag-an unsai dagan unya. daghan pman hinuon ta ug kapilian. dili pod ta kaingon nga trapo ni cya kai na-mayor nman ni cya sa una. Yeah i just hope they will choose the best candidate. thanks! Bonggang bongga! Sana makasali din me sa mga ganyang okasyones. May bonngang bongga akong itatanong sa mga yan! Aylabbet!!! Salamat ng bonggang bongga! Na-aadik na ata ako sa blogging ngayon. Halos ma Eklavoh ang beauty ng lola mo in the past phew days... hayyy kaloka!!! taga cebu kaba? Tabangi intawon si Bayani Fernando he is the type of Leader our country needs kay Honest,intelligent,kugihan,maayo gyud nga manager/administrator w/ strong political will who can re-engineer our country.forget about the looks pls look at his qualities as a leader his track record.Si Villar kawatan,Erap ambot!,Noynoy walay experience,Gibo Cojuangco lang gihapon they will only protect their interest.In experience also , a good lawyer siguro sa Senate na lang sya alisdan niya si Lito ug Bong, Jingoy.Go Bf ! 2010 Go! Go ! Go ! Good Point there, thanks for sharing, it would be helpful to everybody.